In the long list of things unexpected about parenthood, the idea of registering a “teachable moment” falls pretty low on the list — but is something that has fundamentally changed the way we thinking about, well, everything. And Election Day is one of those teachable moments that’s made us realize that whether or not we pull the lever on November 6 is bigger than us and our own engagement (or disengagement). It’s beyond partisanship or politics. It’s an opportunity to demonstrate to our children that each individual plays an important role in the world around them, and that our ability to voice our own opinions isn’t something that should be squandered or taken lightly. We love the Take Back Tuesday campaign — and we love hearing stories from parents about taking their kids into the voting booth with them. 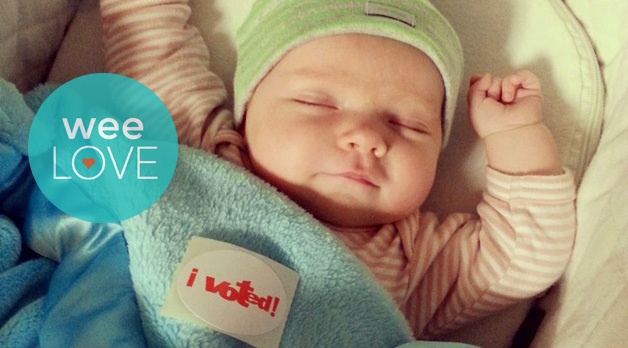 Share your own photos of your kids voting with you on our Facebook page, or email them to us. Next story Free (important) stuff for new moms: lactation support!